As projects within the Civil Society WASH Fund complete their final years, people are asking what lessons can be learnt across the 29 Fund projects, and which WASH approaches have proven effective. These are big questions and not easy to respond to in comparative terms – it is difficult to say which approaches are more effective than others due to the enormous variability in contexts and challenges being faced. After a recent visit to Plan Indonesia, what we can say is that the sanitation marketing approach being taken in that context in conjunction with Government of Indonesia’s Community-Based Total Sanitation (STBM), is highly effective and having impact at scale. Project beneficiaries are far exceeding expectations, particularly in sanitation and hygiene where numbers achieved are already double expected and likely to be more than three-fold by project end. Plan’s approach is to catalyse and support and government systems into action following the national STBM approach (described in another Postcard) and collaborate closely with WASH working groups at all levels. Plan also ensures government leaders commit to replicating their work in an equivalent number of locations. In addition, Plan’s budget advocacy has been important in securing funding to STBM in local plans (or roadmaps), and documenting processes (such as the step-by-step STBM manual) has assisted training and replication in other areas. With this approach, Plan has been able to have a large impact with a relatively small team (10 core project staff). The project works in areas with high open defecation to increase sanitation demand and address supply. 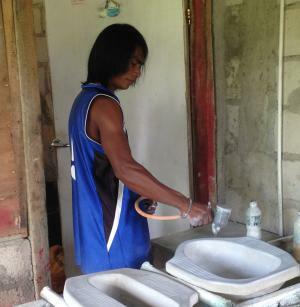 Their sanitation marketing approach worked in the early years to identify and foster sanitation entrepreneurs, particularly for the production of toilet pans. Setting up a provincial hub in Kupang, Plan sought expressions of interest from potential sanitation entrepreneurs and assessed their applications on both skills, motivation and interest in helping their community. Plan did not provide any start-up money or capital – only training and skills. With initial assistance from Plan, Ms Jenie is a now a successful sanitation entrepreneur in Kupang. She has focussed on making toilet moulds. She sells the moulds and production know-how to other areas where local producers make up to 3 pans a day. To date she has sold over 700 moulds both within her district (Kupang) and province (East Nusa Tenggara) and beyond to other provinces (West Kalimantan, West Papua, Sulawesi, West Nusa Tenggara) and even internationally (Timor-Leste). The impact and reach of this sanitation supply chain fostered through Plan’s CS WASH Fund project has reached far beyond their project areas and in all likelihood has reached many tens of thousands of beneficiaries. Plan has also helped establish associations of sanitation entrepreneurs to continue product innovation and quality improvement and share information. Associations consist of sanitation entrepreneurs with a range of complementary skills. Entrepreneurs such as Mr Riwu (pictured, left) value membership of the association as it also helps them access products at bulk-buying prices and share information about product quality. He uses moulds bought from Ms Jenie in Kupang (moulds are green and yellow and shown in bottom photograph) to make latrine pans for his and surrounding communities on Sabu island.